These days I am surrounded by men. From my husband to my three sons, scores of nephews, dad, growing circle of brothers (as of now I have 7, which includes one I just met for the first time last month and a brother-in-law who just moved to Pittsburgh from Philly with my step sister). Every where I look testosterone abides. So for that reason, I also have gained access to the secret world of Black dads. And let me tell you mamas, it’s a pretty tough world. I’ve seen all the dads in my life struggle with this world that doesn’t always work in their favor, but one thing I can say, is that they all persevere and are trying to be the best dads they can be. Most of them, didn’t have the best example growing up and are slowly putting the #gooddaddy playbook pieces together on their own. For that, I must commend them. In America, we give out awards for people who excel at making music, acting like someone other than themselves in movies (which I think is a little psychotic), for sports and even for modeling. On BrownMamas.com we like to recognize people who are doing the real tough jobs: moms and dads! The #GoodMama campaign already has the brown mamas covered, so here’s my ode to the brown daddies in my life who are taking care of business. Yes, he’s my husband. No, that’s not why he wins the No. 1 spot as our Most Valuable Daddy. 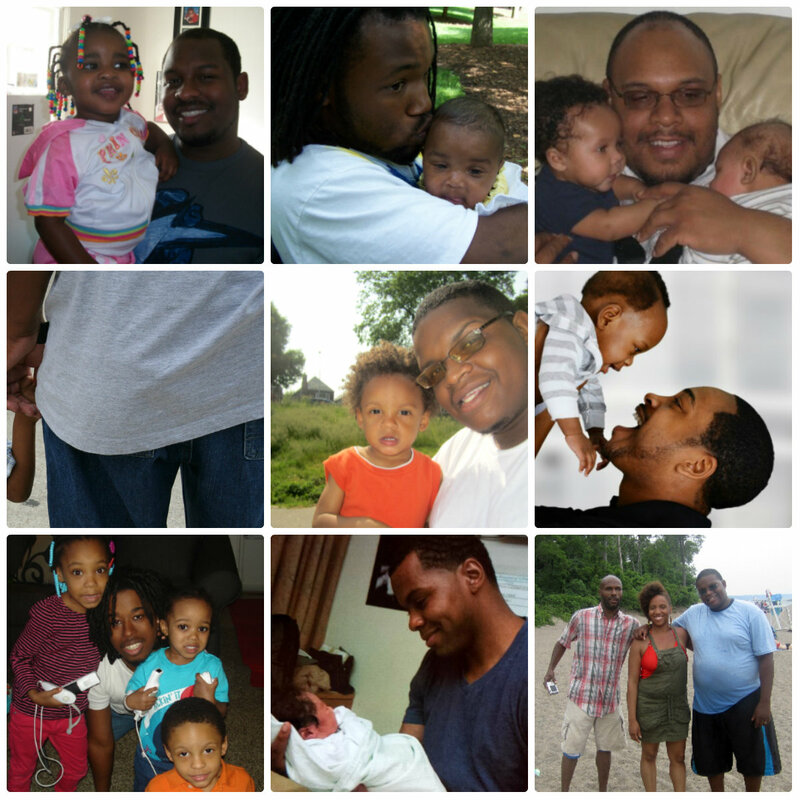 My husband is a phenomenal dad. In addition to being a patient, kind, steadfast dad who is always there when his children need him, my husband has been a father to me in many ways. Without my husband unconditional love, I wouldn’t be the woman that I am proud to be today. That’s why he’s my MVD! I am so proud of my dad. Getting to know him over the last 5 years has been one of the most enlightening experiences I’ve had in my life. I always say, ‘my dad wasn’t the best father to a child, but he’s been a phenomenal dad to me as an adult.’ He’s taught me how to garden, how to use some power tools, how to trust myself and he’s made me feel whole as a person. It’s been a long time coming, but I love my dad! One of the perks to getting to know my dad has been the extended family he’s brought along with him. Dellie is my oldest brother and it’s been quite a joy watching him support and love his children. He’s the most hands-on dad of 6 that I know. From getting them up in the morning, to chores and dinner time, Dellie wins the Dad of the Year award by a landslide. In addition to that, I’ve seen him be very supportive and attentive to his wife’s needs. (And ya’ll know I’m a sucker for men who are good husbands) Well deserved Dellie! Uncle. That’s what my sisters and cousin call our uncle, ’cause he’s the only one we have. In our family my Uncle has done the job of 15 men, as one of the few men we have in our immediate crew. He’s been through his fair share of ups and downs, but whenever we need him, he tries his best to be there for us. Even though he doesn’t have a ton of people rooting for him in his corner, he gets up everyday, puts the world on his shoulders and is determined to be the best dad he can be to his 6 beautiful children. Happy Dad’s Day Uncle! I really believe in this man. One of the things I love about Kendall is his willingness to listen. This confident dad of 4 loves his children to the ends of the Earth, and they all know it. He may not get it right all the time, but with every blow he gets right back up and gets back on track. You can see the love Kendall has for his children in their personalities. His daughters think their princesses and his son knows he’s The Hulk. I awarded him Most Likely to Succeed because he’s a fighter and I know eventually it will pay off. Talk about somebody who likes being a dad. Maurice (or Reesie as family calls him) has never been happier than since he’s gotten engaged and solidified his family. He’s a dad of 3 and, seemingly, couldn’t be happier doing it. I’m so proud of my cousin’s willingness to be such a good father. One need not look further than his Facebook page to see the countless pics of him out and about with his little girls (he has all girls) supporting them and showing them off. My cousin was born with the spirit of daddy all up in him and I enjoy watching him enjoy it! He’s a brand, spanking new dad, but the look in his eyes when I see him with his new baby boy says he’s been waiting a lifetime to experience this. Every time I see Travis he’s smiling. In addition, on a daily basis he cares for and loves my niece and nephew as if they were his own. For that, I’ll be forever grateful. The longer he’s in this game the further up the ranks I see him going. But, for a newcomer, Travis is taking the cake. Happy 2nd Father’s Day Travis! I just met Judah for the first time about a month ago. He’s my second youngest brother. During our first meal together, I asked him what he liked to do the most and he responded that the thing he liked to do the most was to be a dad. I was beyond impressed with his answer. My little brother is a father of one, and at the youthful age of 23, he’s already grasped what is most important in life: family. I hope that seed continues to grow in him. I’m so proud of his commitment to his daughter.